Pierce got a gift card for Christmas from my aunt and uncle and used it to buy a bow and arrow set. He has wanted to try archery for a while now. Pierce spent all day practicing. Well all day except for when Paul and I were borrowing his bow and arrow. 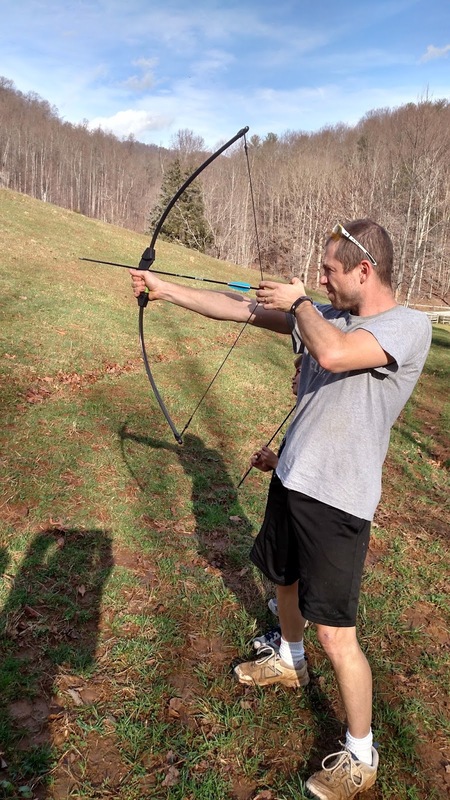 Turns out archery is really fun for kids and grown ups! So we had one gloriously sunny day and then it rained and rained and rained. There was one grumpy 9 year old in our house, pouting over not getting to go shoot his bow and arrows. Hopefully he doesn't accidentally shoot his brothers. Readers, have you ever shot a bow and arrow? 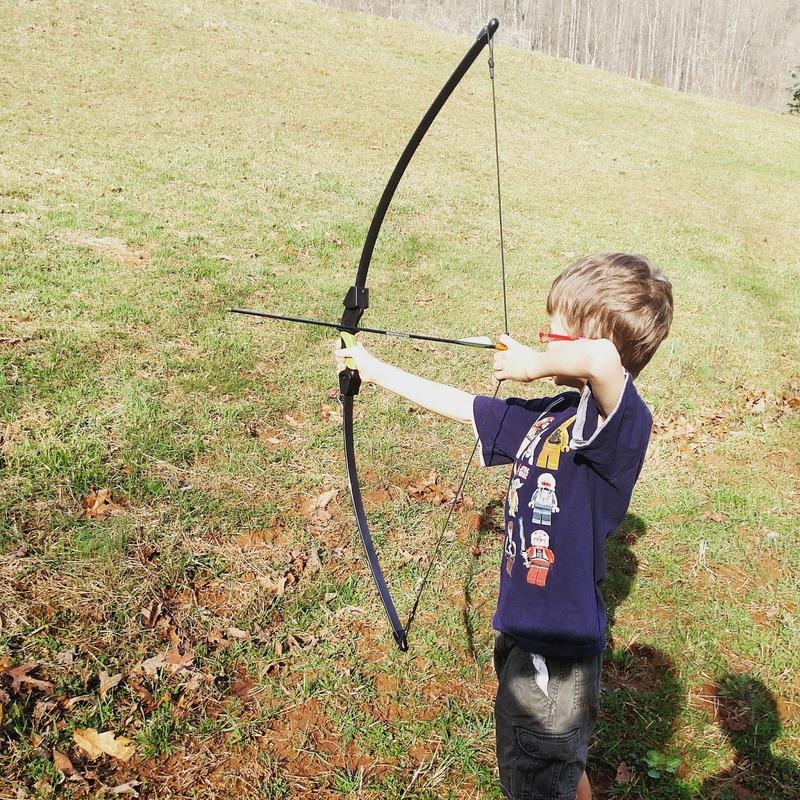 He will be a good archer, it takes a lot of concentration and he seems to be good at things when he sets his mind to it. What a great gift. Where did you find the bow? We've been looking for some time for that style bow in two or three sizes for the bigger family gatherings, but everyone keeps trying to sell us compound bows or even cross bows. When we do find a simple one, it's always just a toy. Pierce's looks like a serious, yet beginning archer bow. He'll never forget his first one. A good sport for all. I used to shoot until it made my fingers bleed. I have hunted with a bow, but found I like targets the best. Shot many a bow. Even made a couple over the years. Most of the early stuff was from my time as an medieval re-enactor I never did like bow hunting very much. I have done a bit but found it too difficult pulling back on the bow. Hope that rain stops soon SOON. We don't hunt, but I think it would be fun for competitive sports and hand/eye coordination. it needs concentration! Very difficult activity. Yes, archery was a hobby of mine but I drifted away from it. My two brothers are bow hunters. It's a great sport for a family to engage in together. I have, way back in high school. It was interesting but I knew I'd be better if I were stronger. Yes, my sister had an old wooden model. I was amazed at how the bow was mounted, because for the life of me I couldn't understand how it attached to the wood! My parents didn't let me use it, so it stayed hung on the basement wall. No don't recall doing that particular sport - but it looks fun, especially being out in January wearing shorts! Haven't we been lucky here in NC so far this winter - fingers crossed it doesn't zap us all at once come February/March! Happy new year - happy week. My boys love archery. They have done it at Hummel Day Camp during the summers. It is fun. Bet they are not outside in shorts today!!!!!! That weather changed quickly, didn't it? Yes, we have a toy one too! How exciting. We had archery in High School but I haven't done it since. no, i never had a bow & arrow . . . looks like fun, though. My Grandson is getting into shooting bow and arrows also. We got him a case as part of his Christmas gift.